What follows on this page is a history of Staffordshire china makers Hudson & Middleton/Chapmans written by Helen Gregory (ne Chapman) a family member who witnessed it first hand. This document represents a unique historical record and I am very pleased to give Helen the platform to tell her story - an important social document of a time now lost. It's interesting for me to read Helen's account because it was at a time when the potteries were in full flow. It was a time I never really experienced as I came much later onto the scene when the decline in the industry from its Victorian and Edwardian heyday was long gone and terminal decline had set in for all those not prepared to radically re-think their design input. So , the six towns of the Staffordshire Potteries have a history long steeped in the twists and turns of human endeavour. We pinpoint one such story here. Hudson & Middleton/Chapmans specialised in fine bone china. Bone china, is the most expensive to produce of all fine china luxury wares, and represents all that is taxing about entrepreneurship. The history of bone china specialist Hudson & Middleton of Longton shows all the best (and sometimes the worst) attributes of success in a difficult arena. 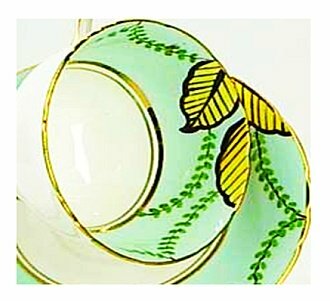 A strikingly graphic H & M design for a Sutherland bone china tea set. Longton is the newest of the 6 Staffordshire china towns, but became a focal point for bone china production. The early 1800's saw the first bone china porcelain production, led by Mayor John Aynsley. 1834 there were 48 bone china manufacturers. A contemporary journal described Longton as being equal to Burslem as a the heart of fine china production "... ware of great lightness and beauty was produced, fully equaling that for which Chelsea was famous. 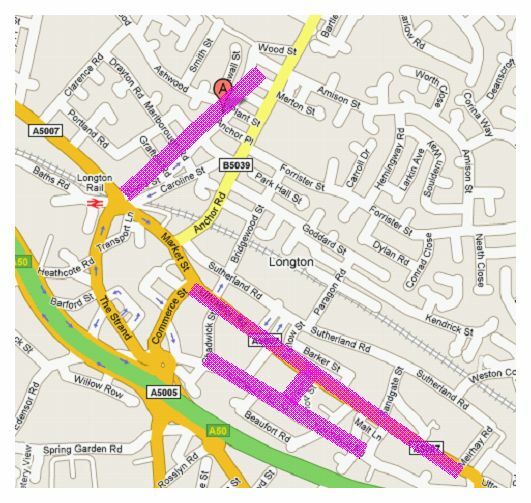 It will thus be seen that Longton deserves to rank with Burslem". So it was that in this vibrant Staffordshire china town in 1870 William Hudson & J. H. Middleton decided to enter the bone china trade together. As one of the few remaining bone china pot-banks to have dodged the takeover and asset stripping bullets and still going strong, I have long been fascinated by their history and tried to find out more details. This traditional, family-owned company is one of the original Staffordshire china manufacturers and works to the highest standards of design and production. Hudson and Middleton, founded in 1875, is one of the few remaining bone china manufacturers in England. This Museum partner of the is one of the oldest Staffordshire china potteries in the UK, and combines traditional skills with modern technology to produce our range of mugs. Manufacturing to the highest standards, they use skilled craftspeople who in many cases have been with the company all their working lives, handing down their expertise through the generations. Hudson and Middleton's products sell in garden centres and high street stores in the UK, France, Russia and Hong Kong and in the Museum shop and Online shop. Then along came Helen! Thanks to her for this great article from the 'inside'. I am sure all Staffordshire China buffs in general and Hudson and Middleton collectors in particular will appreciate her insights onto the history of the Sutherland and Delphine bone china pottery marks. Please be sure to contribute to this Hudson and Middleton page too. After you have finished reading the content, if you scroll to the bottom of the page (here is a 'quick link to get you there fast:- click here to go directly to the Hudson & Middleton - Sutherland and Delphine visitor contribution and query section) you will see a section where you can either make your own submissions or ask questions. Hudson and Middleton is a Staffordshire china maker specialising in fine bone china. They are located in Longton, Stoke-on-Trent. My family connection to this company goes back to the 1800s. My maiden name is Chapman, and my great-great-grandfather, David Chapman established the Atlas Works in Longton, Stoke-on-Trent in 1889 under the company name “David Chapman & Sons”. The china bore the “Atlas” backstamp (the maker’s mark on the bottom of all good china pieces), presumably after the name of the Works. The backstamp featured a hand-drawn picture of a man with a globe on his back and the name “Chapman” written across the equator. 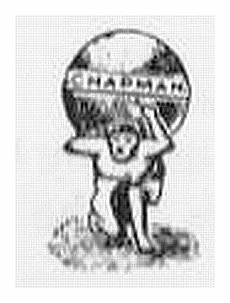 In 1904 the company was renamed Chapman & Sons (Stoke-on-Trent) Limited and then just two years later in 1906, it became Atlas China. However, there is a mystery surrounding the fate of David Chapman and Sons and this Atlas pottery mark. The plot thickens when it emerges that there was a total of three distinct Chapman Staffordshire china companies, all of which were located in Longton, Stoke-on-Trent and none of whom, it seems, were related in any way! As well as my great-great-grandfather’s Staffordshire china company, David Chapman and Sons, established in 1889, there was Chapmans Longton Limited established in 1916 and located at Albert Works, and D Chapman & Sons, which was established in 1882. The latter only existed until 1902 – just 20 years – whilst Chapmans Longton Limited continued through to modern times with its “Standard” pottery mark, amongst others. So back to “our” Chapmans …. 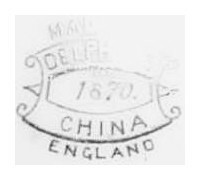 the “man with the globe on his back” backstamp was used on tableware until 1910 and then, confusingly some records state that it was used on the wares produced by the Atlas Tile Works located in Vine Street in Hanley between 1907 and 1920. To add to the confusion, however, there are records that a pottery company called Grimwades, run by the Grimwade Brothers, bought Atlas China in 1906, the very year that Chapmans China changed its name to Atlas China and a year before the other records state that the backstamp was used by the Atlas Tile Works. So which do we believe? My own opinion is that the brand name “Atlas” has become confused over the years with the tile company of a similar name but based several miles away from Longton in Hanley. I can find no evidence of any tiles with an Atlas backstamp, however, the Grimwades backstamp is almost identical to the Chapmans Atlas China backstamp, with the exception that the word “Chapman” has been replaced by “Grimwades” and the actual graphic has been tidied up somewhat (possibly redrawn). In any case, the Atlas Tile Works was listed in the London Gazette on 19th June 1923 by Donald H Bates, a company of liquidators, requesting that creditors of the company come forward whereas Grimwades continued to use the globe backstamp until the 1930s on some of their lines and indeed continued producing some of the Atlas china patterns until around the same time. From 1934 to 1939 the globe element of the backstamp was shelved and the mark became a sort of art nouveau cursive circular script saying “Atlas” on the top and “Bone China England” beneath. Grimwade in 1885 and he was joined five years later by his brother Sidney Richard Grimwade. Grimwades acquired the Winton Porcelain factory in about 1890 and they achieved international fame for their china production and, thanks to Leonard’s desire to advance and develop techniques, the company also set the stage for the future of china production with their use of lithographic transfers and the Chintz patterns upon which the company’s reputation was built. In 1913 after a visit by King George V and Queen Mary, the company started using the “Royal” title on their products, changing their name to Royal Winton in 1930. The first of several coincidences in this tale is that some 75 years later, I would find myself working for Staffordshire Potteries which had acquired Royal Winton some years earlier. So to recap, we have David Chapman & Sons being set up in Longton in 1898, becoming Chapman & Sons in 1904, later becoming Atlas China and two years later being taken over by Grimwades. So how does all this relate to the pottery company called Hudson and Middleton? David and Ann had a son, John Varden Chapman, who was born two years after their marriage but very sadly Ann passed away after just four years of marriage aged only 23 although David went on to marry again and have more children with his second wife. John Varden Chapman was my great-grandfather and this is where the connection with Hudson and Middleton continues. John married Mary Anne Middleton, daughter of Joseph Henry Middleton. The original company, Middleton & Hudson, was formed in 1870 by Joseph Henry Middleton and William Hudson and was located at the Alma Works in Longton producing the “Delphine” brand of china. In 1889 the two partners split, with Joseph Middleton establishing Delphine Pottery in Chelson Street, Longton and William Hudson establishing Sutherland Pottery in Normacot. The date "1870" on this backstamp refers to the original founding of the company when it was Middleton & Hudson. Joseph Henry Middleton died in 1910, however four years later, by 1916, the two families were clearly working together as they invented “An Improved Teapot and Infuser”, the inventors being named as William Hudson, George Edwin Barlow (father-in-law and son-in-law) both of William Hudson & Co and my great-grandfather John Varden Chapman of JH Middleton (Delphine Pottery). Interestingly, the patent states that they are “all of Delphine Pottery”. It is not known for how long this letterhead was in use but it is interesting that felllow Staffordshire china makers Hudson and Barlow are listed as being partners in JH Middleton & Co.
Of the three partners noted on this letterhead, you will recall that John Varden Chapman was my great-grandfather. He and his wife Mary Anne Middleton had 3 children, of whom my grandfather was the eldest. Eric Varden Chapman was born in 1898 with Roy Middleton Chapman and Norah Varden Chapman being born 1 and 9 years later respectively. Interestingly, the 1911 census notes that as well as a servant, there was a nephew of the family, Sydney Varace Chapman, who was the same age as Roy, was also living with them at that time. I wonder what his story was and why he was living there? 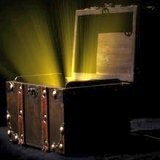 Any genealogists reading this may wish to enlighten me! My grandfather, Eric Varden Chapman, whom I never knew, married Ivy Maude Howe in 1927. The previous year his brother, Roy, had married Frances Gunson and the following year his sister Norah married Harry Averill. What a busy three years for the Chapman family with one wedding in each year! Eric, probably by virtue of being the eldest child, joined JH Middleton’s Delphine China upon leaving school whilst Roy Middleton Chapman went on to become an accountant in Hanley, coincidentally going into partnership with Donald H Bates whose company were the liquidators for the Atlas Tile Works in 1923. In 1941 the Government commandeered JH Middleton’s factory to store WW2 munitions so the two companies joined forces once more to become one Staffordshire china maker again called Hudson & Middleton at Sutherland Pottery in Normacot Road, Longton. After the war, it is believed that JH Middleton re-opened again for a short time but eventually it was decided that as it was the smaller of the two factories it should be closed and JH Middleton should join forces with William Hudson at Sutherland Works on a permanent basis. Their main stock in trade was tea sets – cups, saucers, side plates and bread and butter plates and both Delphine and Sutherland backstamps were retained and an H&M backstamp was also used containing the lion rampant. My father, George Eric Varden, was born to Eric and Ivy Chapman in May 1932. His life was dominated by music, particularly the church organ and he became the organist at Draycott Parish Church near Blythe Bridge where he lived, from the tender age of 8. After excelling at academic subjects (but certainly not at physical education – he used to proudly tell us the tale of how he regularly took a short-cut during cross country runs so that he could spend an hour playing the organ!) at Newcastle High School, dad’s greatest wish was to go to University to study medicine. However it was not to be. As the eldest (and only) son, he was expected to join his father in the family business. By now his father Eric Chapman was running the business with his partner Eric Hudson Barlow, a descendent of the Hudson family, and soon after my father joined the company, Eric Barlow’s son Grenville also joined the team. Gren told me how his grandfather, George Edwin Barlow, “lived for the day” when Gren would join the firm but sadly only lived for about a year after he eventually did so. Like dad, Gren’s heart really was not in the china manufacturing business and, had he had the choice, he would have pursued a career in electronics and didn't really fancy being a Staffordshire china maker. 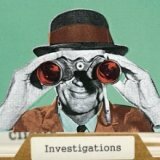 Until investigating my family tree, I had always incorrectly assumed that “Uncle Gren” and “Uncle Eric” as we called them were close relations of ours but it seems he was just called “Uncle” without being any close relation other than being my Godfather. Nonetheless, considering my great-great-grandfather David Chapman married Uncle Gren’s great-grandmother Ann Hudson, there is a tenuous family link but how many times we are “removed” from one another is anyone’s guess! Around 1952, dad was called up for National Service as part of the Suez Crisis and landed a job as an Officer in charge of radio communications. Dad should have been posted to the dangerous war zone of Egypt where many servicemen lost their lives in terrorist attacks, but luckily for him, his communication equipment was accidentally shipped to Malta and the decision was made to post dad and his troops to Malta rather than re-route the equipment. By all accounts, he spent a very happy period enjoying the sunshine and playing the organ in Valletta Cathedral without encountering any danger whatsoever. Once dad’s posting in Malta ended, he returned to the UK and back to his job at Hudson and Middleton. Dad and Gren and their respective fathers continued to run the business until Eric Chapman died in 1958 at just 60 years of age. I have some very clear memories of the Staffordshire china Hudson & Middleton factory – how it looked, the people who worked there and particularly the smell. I was born in 1966 and so must have been around 3 or 4 when I first started going there with dad – off to “the works” as the factory was always called in our house. All the doors and window frames were painted a light turquoise or pale blue colour and I can remember very clearly my dad opening the wicket gate which was inset in one of the big factory gates and me climbing over into the cobbled yard behind. I think the gates shown in this picture must have been replaced since I used to visit in the early 70s as I have a very clear memory of having to scramble over the lower part and the wicket gate in this picture looks as if it reaches to the ground. And following close on the heels of that memory is remembering the heady scent of enamel and gold which the ladies in the "shop" (workshop, presumably) used to paint the intricate designs onto the chinaware. To my amusement the ladies all greeted dad with "Good morning Mr George" as we walked round the "shop". Obviously, my dad's surname wasn't "George" at all - that was his first name - but for some reason they all called him Mr George and as a 4 year old I found that very funny. As I walked between the rows of ladies all wearing overalls, sat at benches hand painting plates, cups, saucers and fancies, inhaling the pungent air, they used to spoil me, asking me questions, giving me sweets and chucking my cheeks. 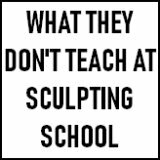 No wonder I loved going there! Another memory I have is of dad taking me up to the first floor of the work and into his office. It overlooked St James' church in Longton and I have a vivid memory of seeing the church covered with scaffolding whilst it was being sandblasted. Up until then it had been a very dark brown colour, almost black, and the transformation to light sandstone was nothing short of miraculous to my young eyes! The left hand picture shows the church in the 1950s and the right hand picture was taken in 1994 – still clean! In the 60s and early 70s, the factory diversified from manufacturing mainly teasets and dinner services to producing all manner of decorative – and sometimes useful – items such as ashtrays, cigarette holders, candlesticks, cruets and bonbon dishes as well as bone china “fancies” – ornaments such as little pots, vases, boots, swans, candle holders, brooches and napkin rings filled with tiny handmade pastel coloured flowers. There was quite a trend for this kind of ware at this time with other Staffordshire china manufacturers such as Coalport, Aynsley and Crown Staffordshire producing very similar items. Online I can find numerous examples of the type of product I can remember being produced at the factory (we had many of the items at home too, and my mother frequently wore some of the brooches) but very few with the Sutherland or H&M backstamp. In the early 1970s, Eric Barlow became so worried about the death duties the two younger men would have to pay, should anything happen to him, that he persuaded my father and Grenville Barlow to sell the business. His greatest fear was that death duties would take all the working capital out of the business. Hudson & Middleton was sold to Barker Ellis Silver Company, part of Pentos Holdings in 1972 and the three men worked alongside Terry Mawr from Barker Ellis for approximately two years until they finally left the company. Barker Ellis continued the business under the Hudson & Middleton name but in mid-1975 the company was sold to new owners, including the former managing director George Fairweather. The new business operated as Hudson & Middleton (Longton) Ltd. In 1978, Hudson and Middleton became the last Staffordshire china pottery company to fire a bottle kiln. Pollution had been a major problem in the Potteries because of the large number of kilns (remember the two very different pictures of St James’ Church earlier in this story?). It was not uncommon for the sun to be virtually blacked out by the smoke and if it happened to be snowing, it would come down as black snow. Many people remember walking the streets and not being able to see their companions next to them. Not surprisingly the area had a very high death rate associated with diseases of the lungs. The Clean Air Acts of the post war period have done much to improve the environment. Between the years 1956 and 1960 a major drive was made to end, once and for all, the bad old legacy of smoke pollution. The Clean Air Act and the development of the continuous pottery kiln fired by gas or electricity between them combined to make the bottle kiln redundant and by 1958 more smoke was coming from domestic fires in the city than from pottery factories. 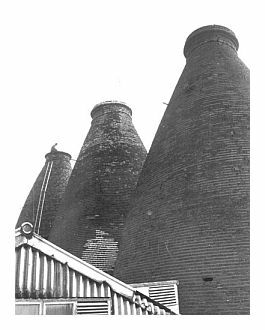 In its heyday there were up to 4000 bottle kilns in the Staffordshire china Potteries with as many as 2000 still standing in the 1950s. By 1958 only 438 bottle kilns were actually still in use with 654 kilns being fired by gas or electric and by 1965 no bottle ovens at all were in use. Today there are 47 bottle kilns left, all of which are listed buildings. I was present at the last firing of a bottle oven. Gladstone Pottery Museum had organised it and it was a huge event in the area. This was 1978 and special dispensation had to be given by the council to allow the firing, following the Clean Air Act of the 50s. I’m not sure why Hudson & Middleton was chosen but it was certainly a great honour. Mum also has a lovely watercolour painting of the event hanging in her lounge. In 1982 Jesse Shirley & Son acquired Hudson & Middleton. Jesse Shirley was the world's oldest producer of bone ash, a key component in the manufacture of bone china and with Hudson & Middleton having a capacity of 3-4 million pieces of bone china per annum, this provided Jesse Shirley with a unique ability to trial body formulations and recipes in a production environment. In 2009 Hudson & Middleton went into administration, along with its parent company Jesse Shirley & Son. The administrator, KPMG, said at the time that the collapse of Wedgwood had been instrumental in the fate of the two companies, with Jesse Shirley’s sales of bone ash dropping by 30% and with bad debts of approximately £120,000 across the two companies. After several attempts to secure Jesse Shirley & Son’s financial future, private funding from overseas was procured and the company was bought out by a group of its Egyptian suppliers, who joined forces and formed a parent company called Hajco 377 Ltd. Sadly, this renaissance lasted just over two years and in October 2011 the company collapsed under crippling trading conditions and all its employees were made redundant. On a happier note, Hudson & Middleton was saved from receivership and was bought for the princely sum just £1.00 by an investment consortium. The company name “Hudson & Middleton” was dissolved and the new company is called Hudsons of England Limited although they still use the brand name Hudson & Middleton to sell their china mugs. Today the company is one of the few remaining fine bone china manufacturers based in the Potteries and not only is it one of the oldest potbanks in England, it is also almost unique in that it is still operating from its original Grade II listed building. 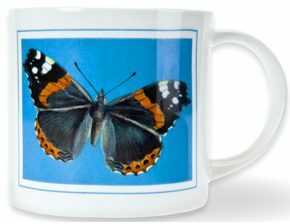 The company now specialises in producing beautiful bone china mugs designed by a host of talented artists and they market their products as “everyday luxury”, “exquisite gifts” and “collector’s items”. Picture of typical Staffordshire china bottle ovens at Alma Works, Uttoxeter Road, Longton taken c 1953-1957. Note the man repairing the furthest of the three ovens. Taken from the Gladstone Staffordshire china Pottery Museum Photographic Collection. This photograph is part of the collections at Stoke-on-Trent Staffordshire china Museums. According to Gladstone Staffordshire China Pottery Museum, this picture was taken between 1930 and 1939 at Sutherland China/Hudson & Middleton, however other records show that William Hudson and J H Middleton were still two separate companies up until 1941 so it is probable that this is of employees of William Hudson & Co, not Hudson & Middleton. This is a view inside the Turning Shop. 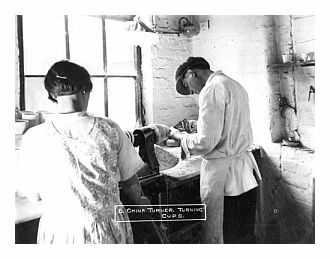 The Turner is shaping the foot of a cup on a turning lathe with an attendant standing by. The attendant would hand a cup to the turner who fastened it to a chuck. He then used a sharp tool to shave away the clay to create the foot as the lathe rotated. This photo was taken in 1930 and is again credited to Hudson & Middleton whereas it is likely that it was at William Hudson. 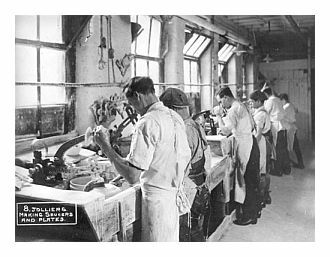 It shows the typical Staffordshire china Jiggering Workshop and although the picture includes the caption "Jolliers Making Saucers and Plates", this process is normally known as jiggering. The jiggerers are making plates and saucers and the mould-runners are supplying them with moulds. The plates and saucers are being made on a jigger. A flat piece of clay is placed on the rotating mould and a levered profile tool is brought down upon it. The mould shapes the eating surface of the plate as the profile tool shapes the reverse. These Staffordshire china machines were semi-automatic. The rotation of the wheel is powered but the levering arm for the profile tool is manual. 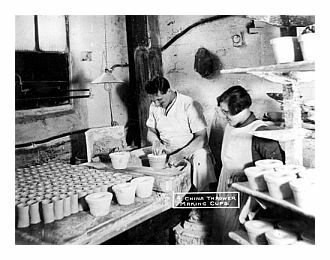 Picture taken between 1930 and 1939 and shows a typical Staffordshire china thrower and his assistant making cups. It is a two-stage process: firstly the thrower throws rough linings, which can be seen on the bench in front of him. He then puts the lining into a revolving plaster mould and re-throws it to get the cup shape. A rib was often used to shape the inside of the cup but it is unclear if the man in the picture is using one. 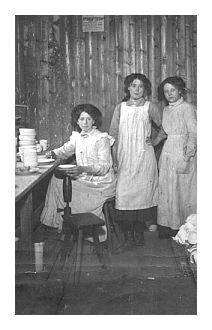 According to Gladstone Pottery Museum, this picture was taken c1910–1919 and was “probably taken at Chapman's pottery factory, Longton”. However, Chapman China existed between 1898 and 1905 and D Chapman & Sons existed between1882 and1902, both companies ending prior to the earliest time this picture was supposed to have been taken (ie 1910). Therefore, which Chapman’s pottery factory was it? The picture shows Staffordshire china factory interior showing a female pottery worker gilding or banding at a bench. Two onlookers pose for the picture. 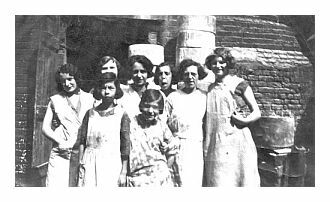 As above, the picture was taken c1935–1939 at Chapman's pottery factory, Longton but this is much later than either 1905 or 1902 which is when we know Chapman China and D Chapman & Sons ceased. The picture shows a group portrait of women pottery workers outside a glost kiln. All pictures taken from the Gladstone Staffordshire China Pottery Museum Photographic Collection. These photographs are part of the collections at Staffordshire China Stoke-on-Trent Museums.